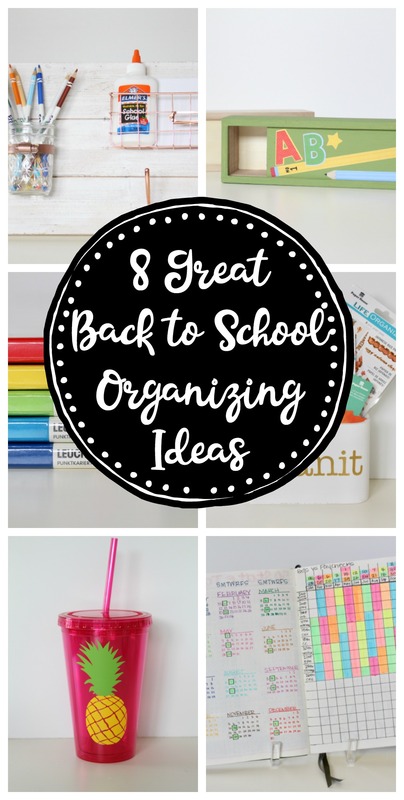 Get set for the academic year with these 8 Great Back to School Organizing Ideas. Catch them live on KOMO 4, Tuesday August 8th at 4pm. All these awesome supplies are available at Ben Franklin Crafts and Frames in Redmond. Parents know your students are always bringing home papers to sign. 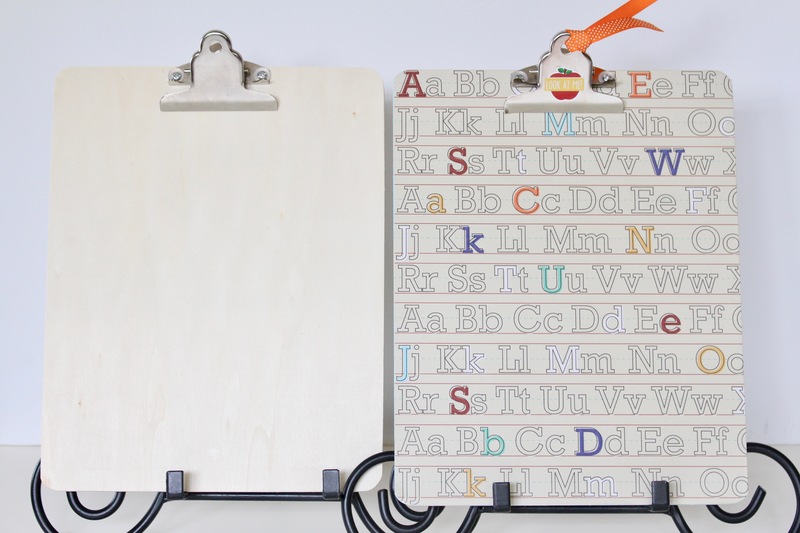 This clipboard makes it simple to keep them organized. Supplies: wooden clipboard, scrapbook paper and stickers (we used Old School from Simple Stories), Mod Podge, sandpaper, blue acrylic paint and scissors or a paper trimmer. 1.Remove the screws in the clipboard and set all the hardware aside. 2. Cut the scrapbook paper to 8 1/2 x 11 inches. 3. Add blue paint to the sides of the clipboard. 4. Add a coat of Mod Podge on the clipboard and glue paper on. 5. Punch screws threw the holes in the paper where they go and reattach hardware. 6. Add apple and “look at me” stickers. Many teachers want elementary aged kids to have water handy for students to sip on during the day. But plastic water bottles can be wasteful and expensive. A smart alternative is a colorful plastic (non-breakable) water cup. Plus your kid can personalize it! Supplies: 16 oz plastic water cup (we used Darice’s Eco Friendly cup (it’s BPA free, dishwasher safe, and durable), and vinyl (we used pineapple vinyl from Vinyl Words). 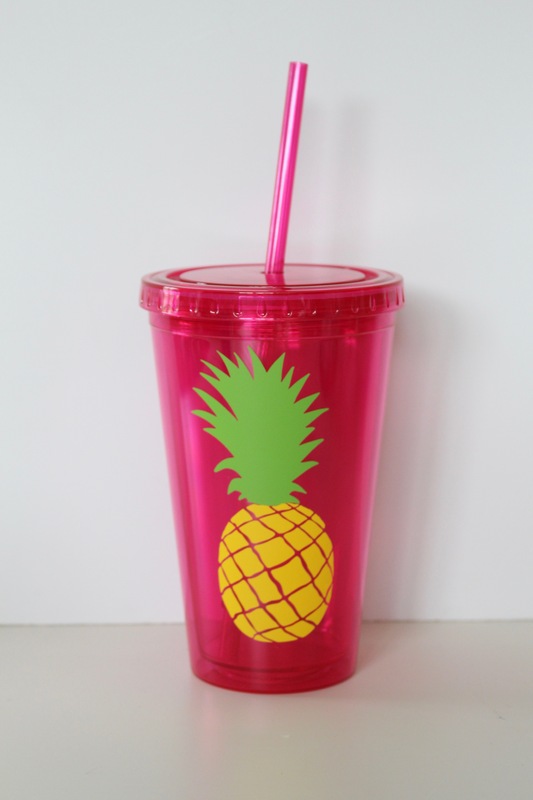 Directions: Following package directions, add vinyl to plastic cup. Kids seem to go through pencils like crazy, then they can’t find any. 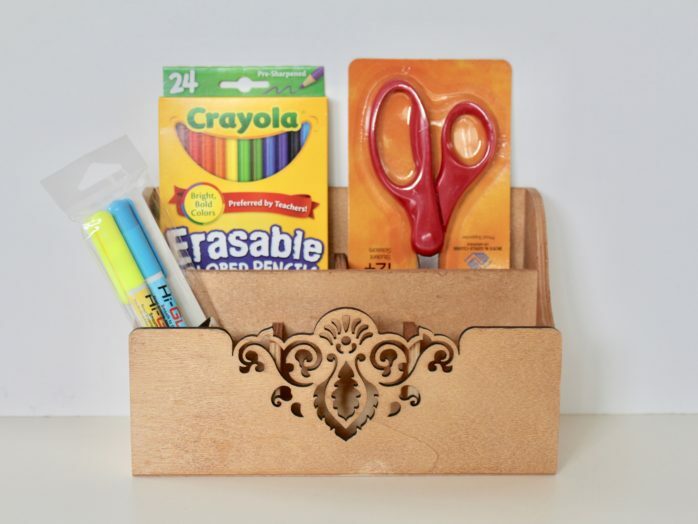 Keep them all in one place with this adorable pencil box. Supplies: small wooden pencil box, green acrylic paint, Stick School Days stickers. 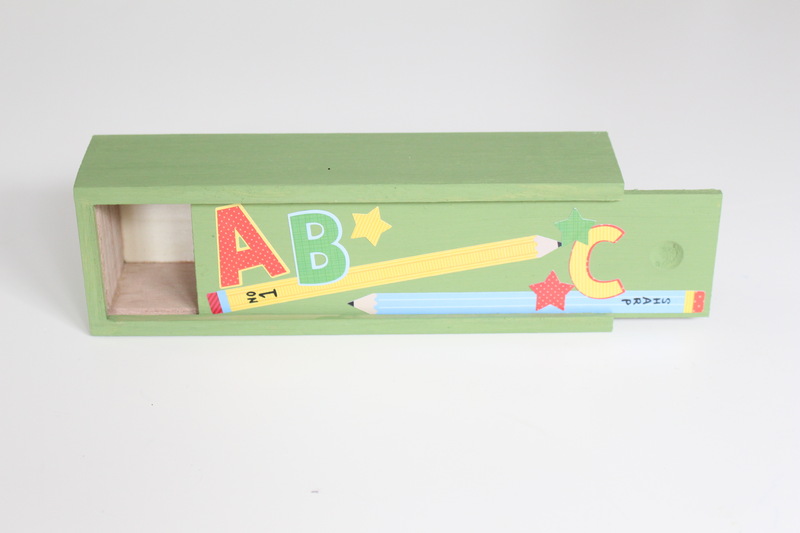 Directions: Paint the box green, add stickers and your stow pencils. 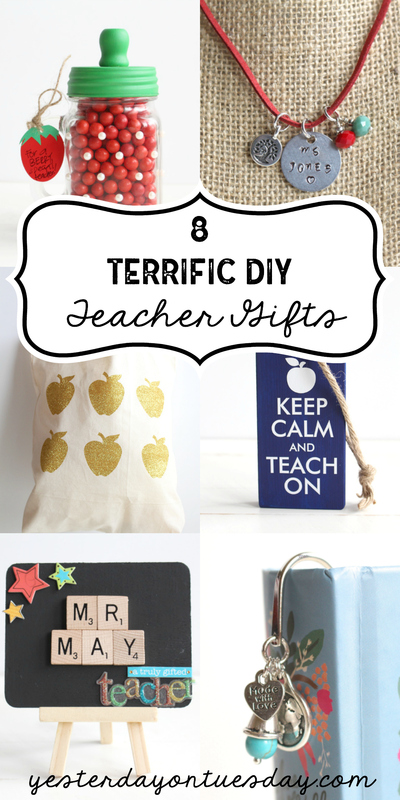 Here’s a great organizing tool for students and their parents too. 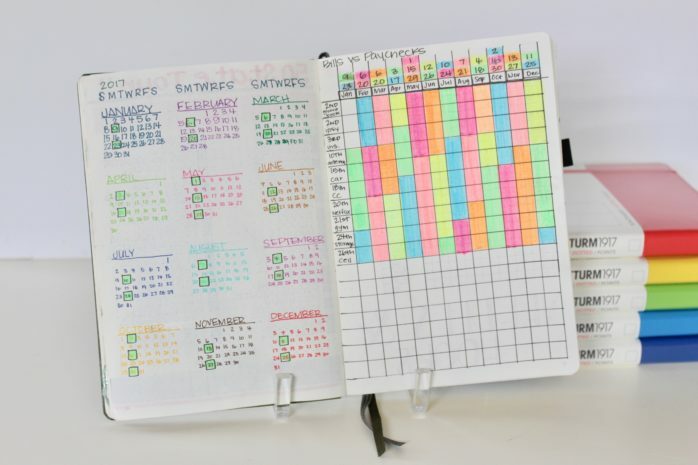 Planners are so hot right now, especially Bullet Journals. A Bullet Journal is a basically blank notebook that you can customize including writing to-do lists, inspiration quotes and art, calendars, and more. 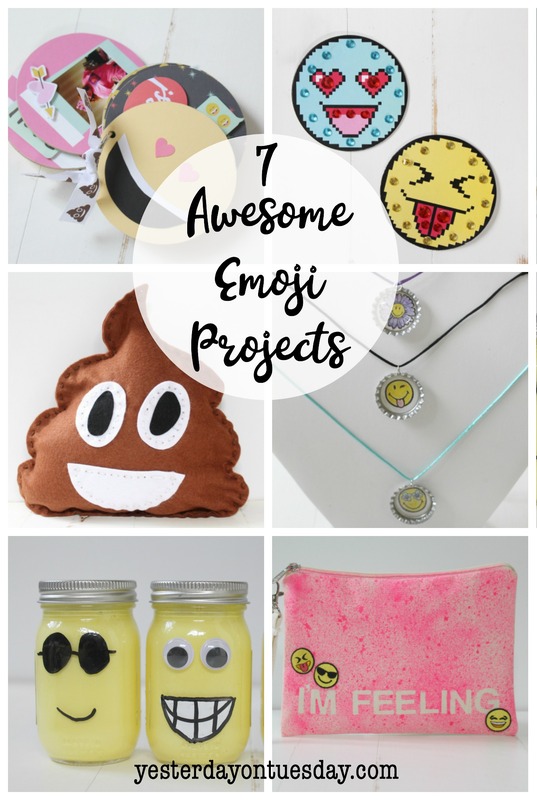 They can also be personalized with stickers, puffy clips, sticker flakes stamps and page notes, pens, paint– anything goes! It’s called “Bullet Journal” in honor of bulleted lists. There are tons of sizes and colors available. 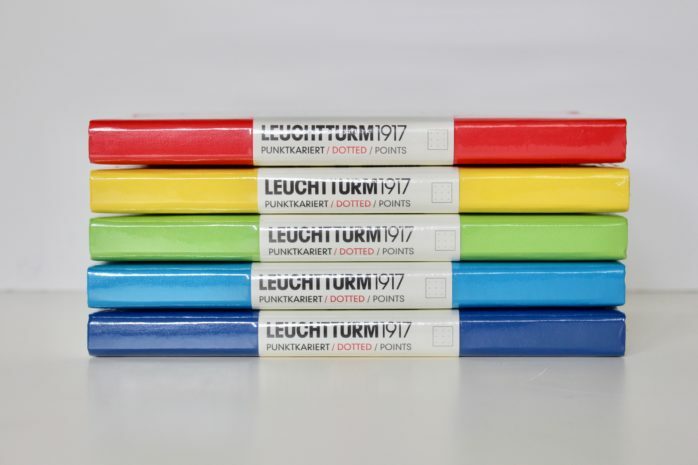 The Leuchtturm1917 is a very popular choice. It comes in every color of the rainbow and metallics too. It includes 249 numbered pages, a blank table of contents, 8 perforated and detachable sheets, expandable pocket, page market and elastic enclosures band, it opens flat and features ink proof and acid free paper. Planners are so popular right now and there are so many darling accessories you can get to really personalize your planner including stickers, puffy clips, sticker flakes stamps and page notes. 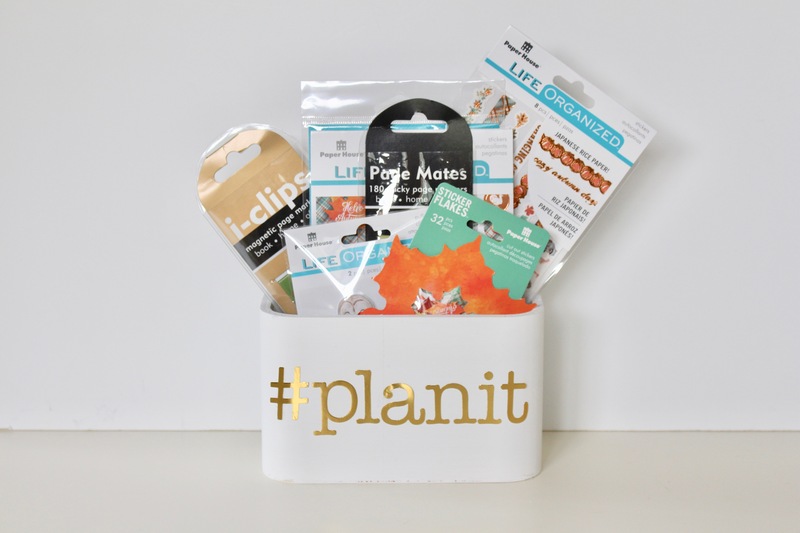 Keep them all handy with this clue #planit Planner Supply Organizer. Supplies: small wooden caddy, white paint and letter stickers. Directions: paint the caddy white, add the letter stickers and fill with planner supplies. When you buy school supplies this year, get two of everything and keep one set at home. That way your kid can easily do their homework at home and if they run out of something at school– you already have a replacement. 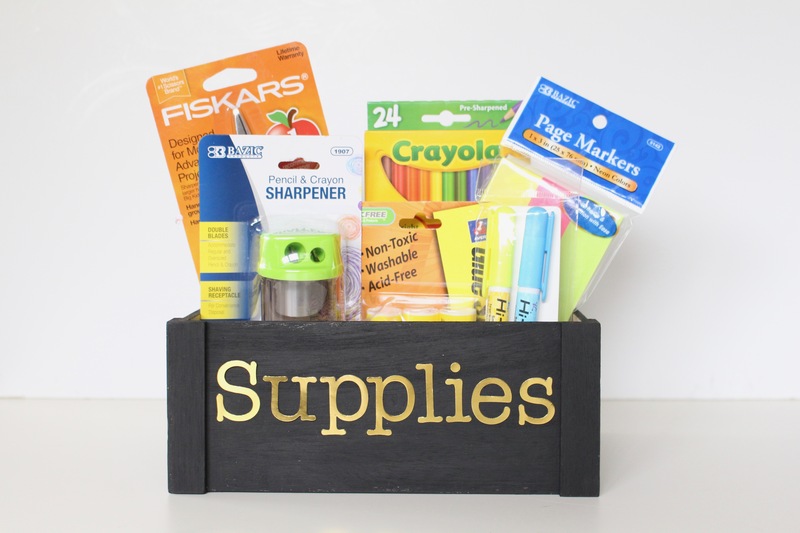 Supplies: wooden box, black paint or chalkboard paint, chalk or stickers and school supplies. Directions: Paint the crate black. If you use chalkboard want, it’s fun to use chalk on it. If you use black pain, use letter stickers to spell out “Supplies.” Place extra school supplies inside. Put index cards, planners, pencils and pens in one place– off the counter(!) with this DIY Organizing Rack. Supplies: white sign, rose gold hooks, rose gold metal basket, mason jar, metal mason jar holder and rose gold paint. 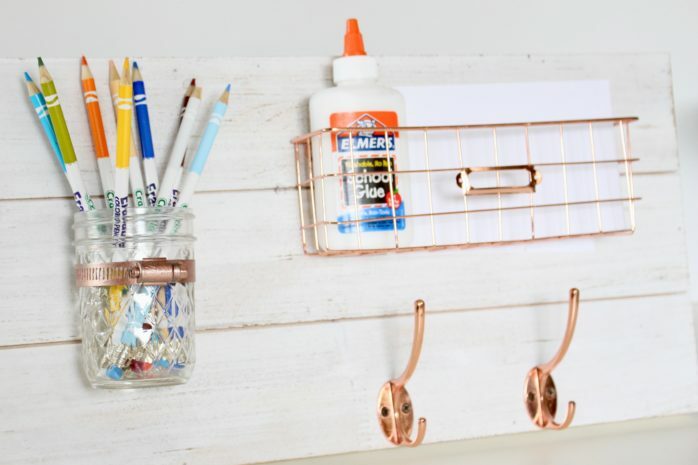 Directions: Paint the mason jar holder with the rose gold paint and screw everything in. Hang and enjoy! Keep must-have parent school supplies corraled with this easy wooden organizer. Supplies: wood organizer and Tint It by Design Master (we used Sepia). Directions: Following package instructions, spray paint the wooden organizer.